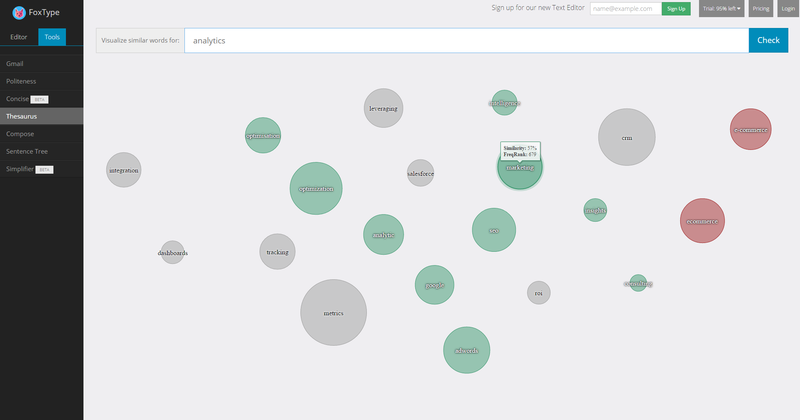 A normal thesaurus might provide you a list of similar words where as this tool visualize the closeness of your words. Writing an email or a note? Compose will help you come up with alternate phrases, grade you on the politeness of the message, whether it's a clear call to action and how long it will take a reader to read it. What else can I say but try it out! You can type anything here to visualize its grammatical structure. Great way to visualize how the AI is thinking and could be a good teaching tool for learning English. "Never use a long word when a short word will do" - George Orwell. This tool analyzes your text and finds words rates them as very common to rare. Then you can use their suggestions to find a more common word to get your point across. You write to be understood and there's no reason to use a complicated word when a simpler one would do.